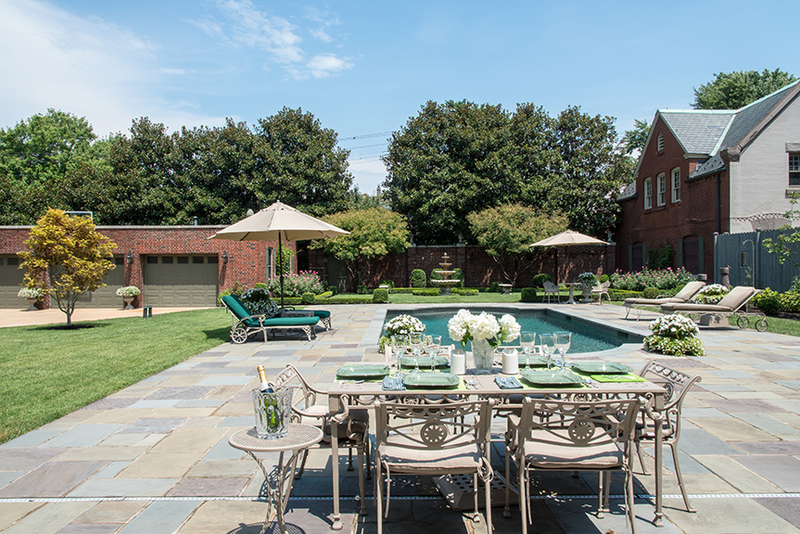 A like-minded couple blends the best of both of their furnishings in their traditional CWE home. In the dining room. one of the homeowner's Leonetto Cappiello posters is prominently displayed above a John Widdicomb buffet piece. A French needlepoint rug was made for the room and complements the colors of the Schumacher damask wallpaper and custom-made draperies. 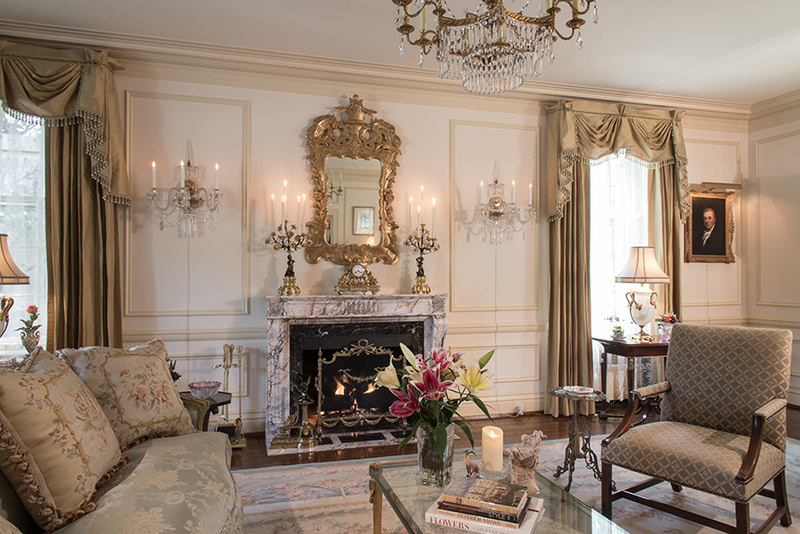 The formal living room showcases many of the homeowners' antique collections, including the Louis XV sofa and matching George III chairs. The homeowners stripped and refinished all of the woodwork in the home. 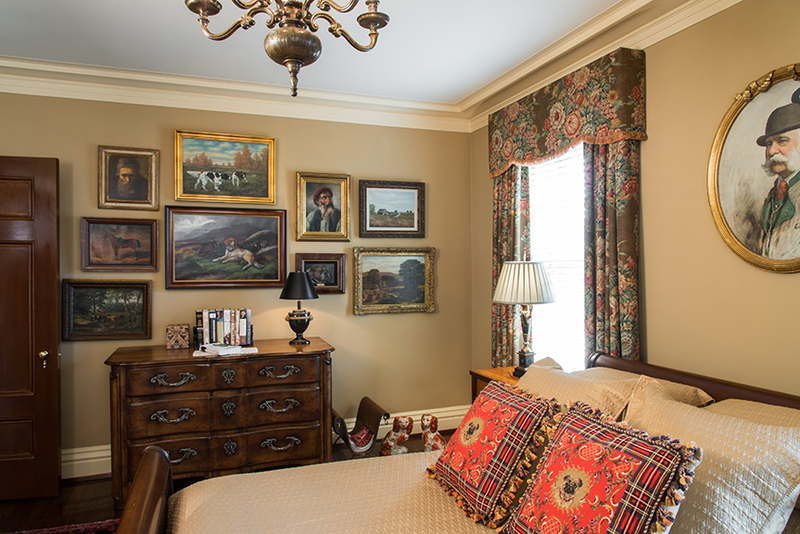 The more masculine of the home's guest bedrooms, rich wood and deep colors give the space a Ralph Lauren feel. 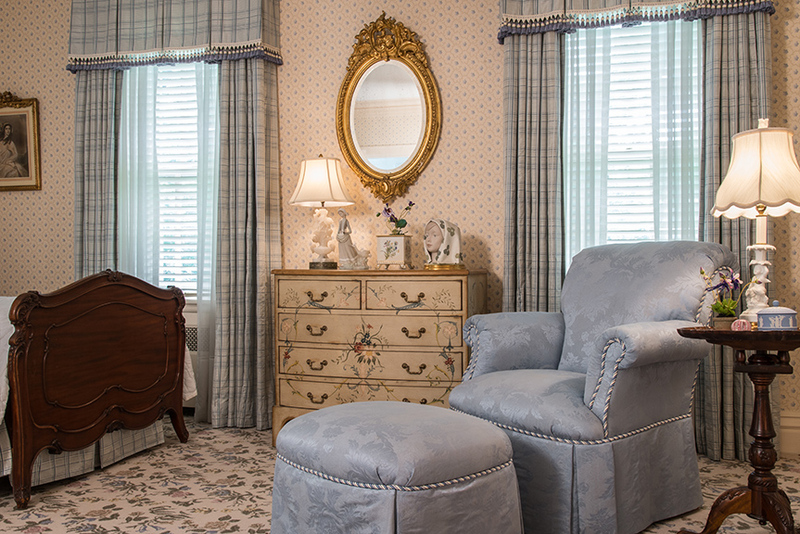 Delicate floral wallpaper, blue plaid drapes and a dusty-blue armchair give another guest suite a feminine touch. Two Regency-style chairs are a favorite place for the homeowners to sit and enjoy their back yard when it is raining. 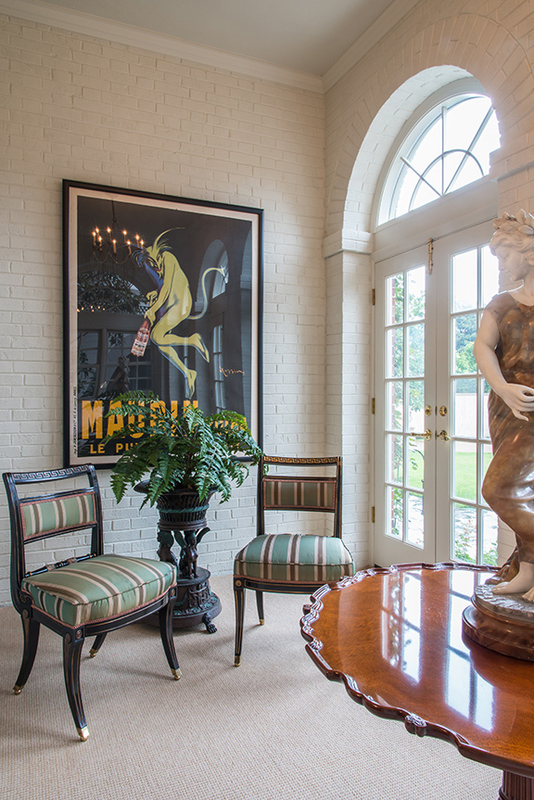 The sunroom also showcases three of the homeowner's Leonetto Cappiello pieces. The homeowners true pride and joy, their back yard oasis has been a work in progress over the last 20 years. Spending their weekends knee deep in soil, the homeowners have planted each tree, bush and flower on the property to bring it back to life. A sprinkle of hers and a dash of his finished with something new is the perfect way to describe the design philosophy of a charismatic couple combining their belongings into one grand residence after years of single living in separate homes. Newly engaged, she moved in several years ago, while he has owned the home since 1998. Since combining households, they have been hard at work removing wallpaper, stripping woodwork and rearranging each room to refresh the traditional decor. Built in 1928, the Georgian-style two-story is manageably sized with newer systems, compared to many of the other historic homes in the area that were built around the time of the World’s Fair. The active couple, who are avid cyclists, loves their city location and their proximity to Forest Park, grocery stores, restaurants and more. “You can leave work on a Friday and not get in a car until Monday,” he says. Even better is the tight sense of community in the neighborhood. In the evenings and on weekends it’s common to see neighbors strolling with a glass of wine, working in their yards or hosting impromptu dinner parties. Both homeowners had lived in the Central West End before moving to other parts of St. Louis, but after living elsewhere they realized the CWE was where they wanted to be. The couple’s shared love of living in the CWE isn’t the only thing they have in common. Both have also always preferred a more traditionally styled home. 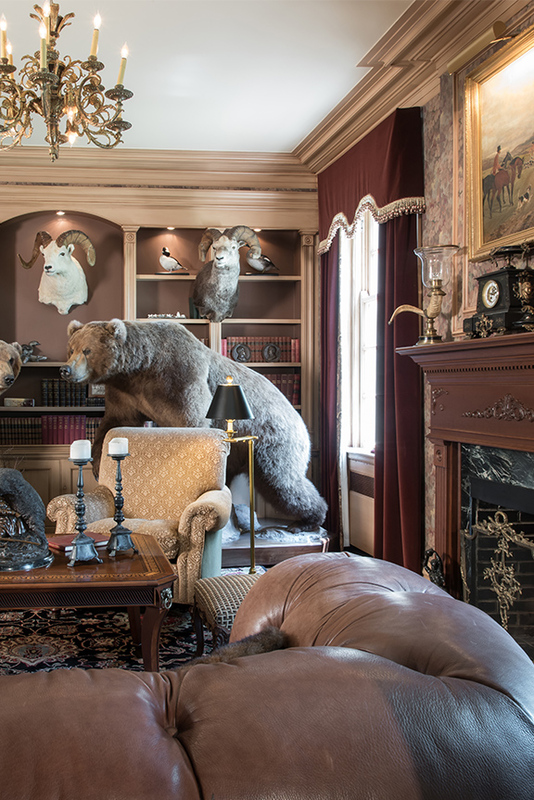 “We like the formality of a traditional home,” she says. So when it came time for her to move into a home that was already decorated and furnished, it was fairly easy to seamlessly integrate her belongings. “We took the best of our two collections and put it all together,” she explains. Over the years, both have scoured auctions for furniture and also acquired items from their travels around the world. They each learned early on in their adult lives the importance of investing in good, quality pieces instead of purchasing the “in” style that would need to be replaced after several years. “The quality and craftsmanship of antique furniture is still as good today as it was in 1700 when it was made,” he says. This is not to say that new items haven’t been purchased to complement their existing furnishings. As the couple has enjoyed living in the home, they continually try to update and improve the house. “We move things around A LOT,” she says with a laugh. And thanks to the designer eye of her mother, the couple always has an outside opinion and fresh take on the space. Projects extend beyond just moving a couch here or a chair there. The couple is not shy about tearing into things and getting their hands dirty. They spent an entire week stripping wallpaper from the entry, hallways and several other rooms. And the lush retreat they’ve created in the back yard is an amazing feat in and of itself, which we will share later. The formal living room sets the tone for the grandeur and formality in the home. An antique Louis XV sofa covered in an elegant silk damask with tapestry petit point pillows sets up a proper seating area when paired with two antique English George III chairs circa 1770. All are centered on the cozy, gas-burning fireplace with the original marble mantel. At the suggestion of her mother, the homeowners added the picture-frame molding to the walls, which harmonizes with the style of the home and furnishings. 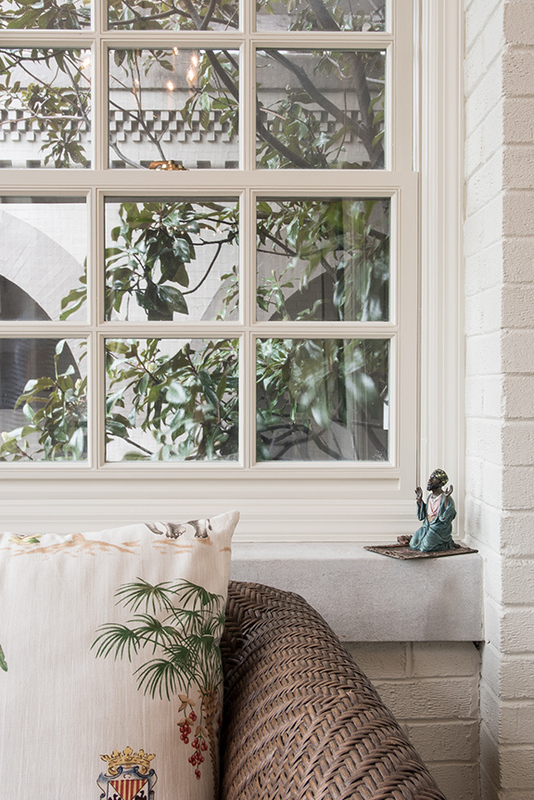 Tucked off the side of the living room, the sunroom is awash in natural light. A set of French doors opens directly to the back patio. “We love to open the doors and sit in there during a rain storm,” he says. The homeowners painted the original brick white, which really brightens the room. 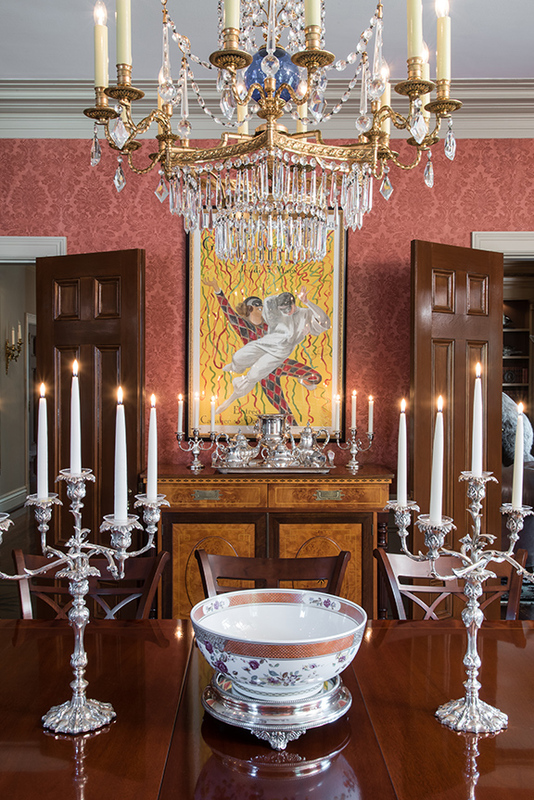 Another Cappiello piece is displayed prominently in the dining room and is one of the homeowner’s favorites, “Theatre National de ‘opéra.” The vibrant yellow contrasts against the Schumacher damask wallpaper. 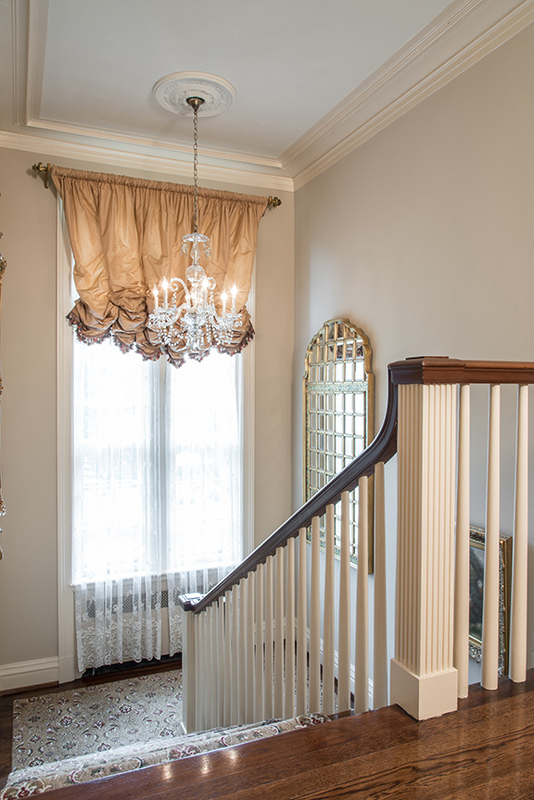 The crown molding in the room is original to the home but the homeowners added the wainscoting panels and ceiling medallion from which a beautiful, gilded crystal chandelier with sapphire sphere hangs. A John Widdicomb dining table with gold leaf accents seats eight in the kindel chairs covered in mohair . 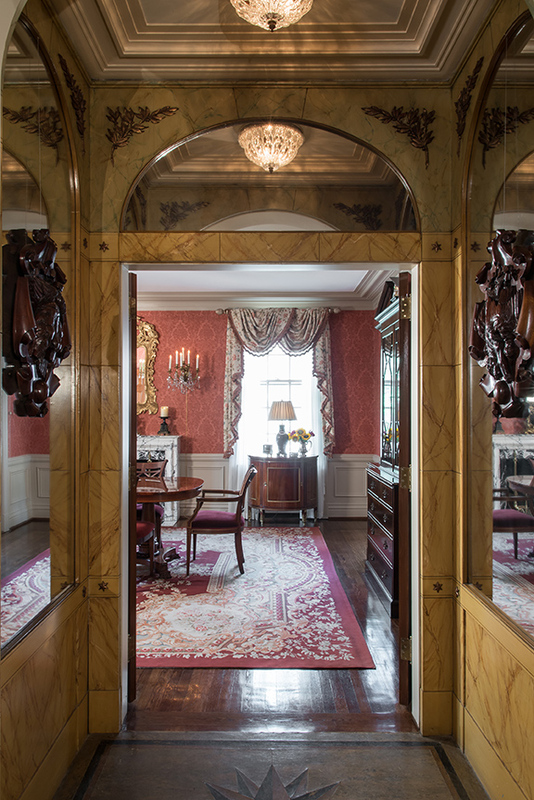 Much of the furnishings in the home are of the Regency and Georgian period, so they easily pair together in a space. The master bedroom and several guest suites complete the second story. 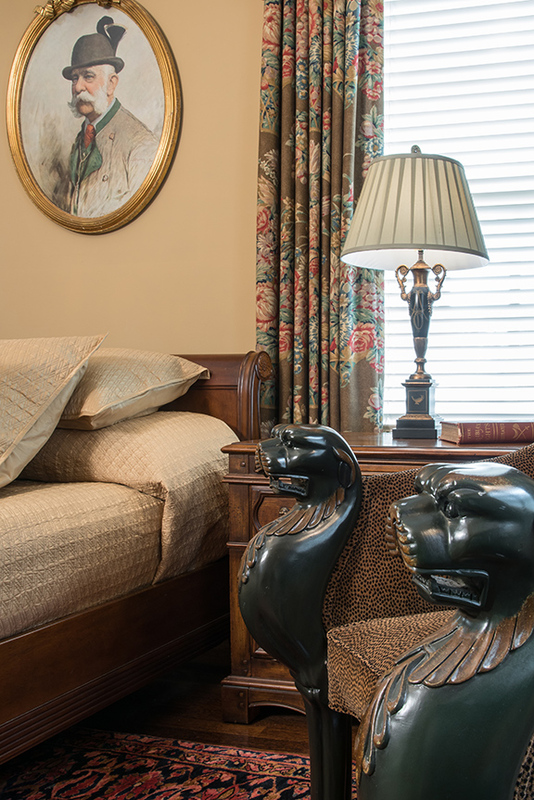 The masculine of the two guest rooms has a classic Ralph Lauren vibe with rich wood finishes and deep color palettes. Dogs also play a prominent role in the throw pillows and artwork. Connected via a Jack-and-Jill bathroom, the second guest room stuns in soft blues and creams. Delicate floral wallpaper, blue plaid drapes and a dusty-blue armchair give the room its feminine characteristics. Any guest at this beautiful, traditional residence can see the careful thought and planning that the homeowners put into styling their home. For many, blending separate collections would result in a hodgepodge of furnishings, artwork and accessories creating a chaotic feel, but this vivacious couple has artfully woven their personal pieces into one grand residence. Ever evolving, the couple’s CWE home is a true reflection of their past, present and future.